For our family, gingerbread houses are part of making the holidays magical. Even as we’ve changed some of our traditions, we find ways to include gingerbread house decorating. We don’t make them to eat, instead they’re a fun decoration and more importantly, the process of decorating them is something the kids love. You don’t have to go all out making homemade gingerbread to include this activity in your holidays (unless that’s what you love, then go for it.) 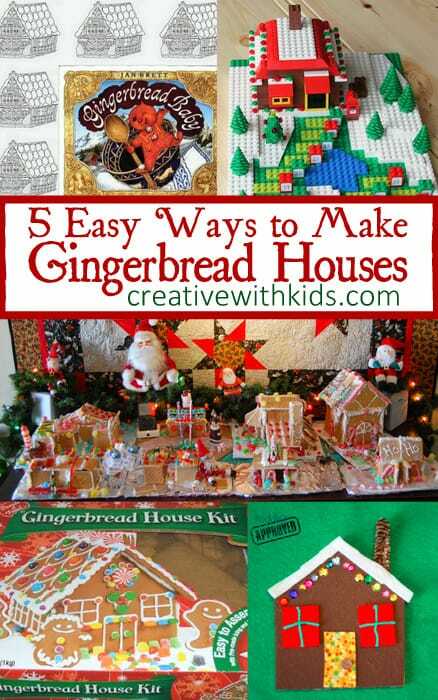 Try one of these simple ideas for DIY gingerbread houses with your kids this year to enjoy this sweet tradition. From top left corner, clockwise. This post includes affiliate links to products that may be helpful for you. 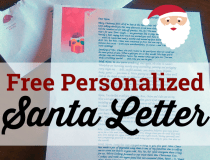 Gingerbread House Mural – free printable coloring pages. 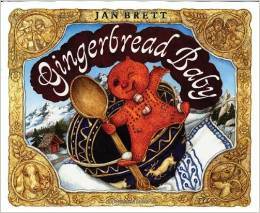 Our family loves Jan Brett’s Gingerbread Baby, and on her site you can print out all sorts of pages with the characters from the books, blank gingerbread house pictures and paper gingerbread candies and decorations to color. This could make a fun collaborative mural. Lego Gingerbread House – Frugal Fun for Boys tells how she made this house and gives ideas on using Legos as advent calendars – fun! You might also try having each person make a little Lego house for a Christmas Village. 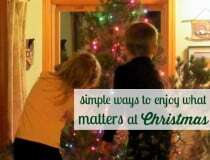 Graham Cracker Houses – This is how our family traditionally makes gingerbread houses. Sometimes we’ve used a hot glue gun to set up the base house, then icing (just powdered sugar and water) to stick on candies. Felt Gingerbread Houses – Toddler Approved shows how she made these easy felt gingerbread houses with her kids. I love that she simply used whatever craft supplies she had around. 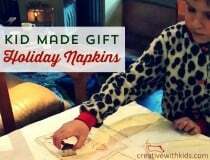 This is a good quick set up activity – just cut your felt and grab a few decorations and you’re ready to go. 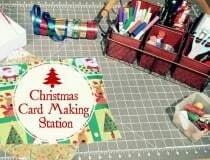 Gingerbread House Making Kit – I have never used one of these, but this kit that I linked to had the most reviews to it and people seem to like it overall and it’s an easy way to enjoy the fun part of decorating a gingerbread house. You can often find these at a craft store or grocery store this time of year.